I thought I would share my thoughts on the new drinks I picked up recently which I was quite surprised by these and thought I would share them with you. So I picked these hot drinks up from the pound shop as the flavours definitely intrigued me and I love to try new hot chocolates or drinks so I knew I needed to give these a chance. 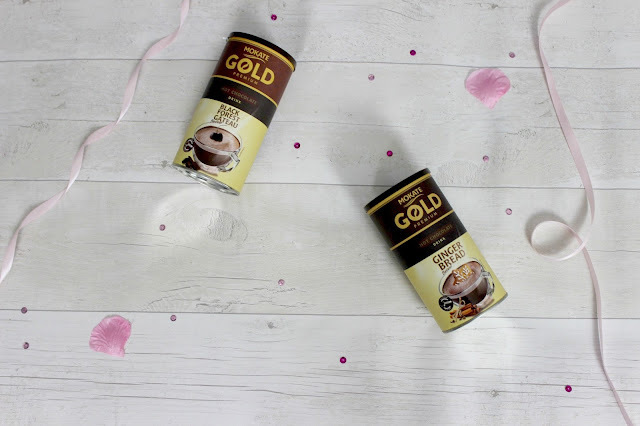 Black Forest Gateau Hot Chocolate – This intrigued me so much as I’m not a fan of black forest gateau and always stay clear of it so I wondered what it would be like in a hot chocolate form – I love it! It’s not as sweet as I was expecting as I kind of expected it to be very sickly and too sweet to actually drink a full cup of it but oh was I wrong I love this one and just adore the taste. Ginger Bread Hot Chocolate – I don’t like much things when it comes to ginger bread scented or taste as I find it too overpowering sometimes but I thought I would still pick it up to give it a go as of course it’s that time of the year where most things are gingerbread. Again I adore this it’s not too strong or overpowering it’s just right and I loved it when I have this and it just gets me into the festive mood too – Not a bad thing right! One thing I love about these is the packaging but also you get a small scoop inside to use as a spoon which I think is such a good idea and I would honestly recommend these drinks and they are inexpensive, as I said I wasn’t too keen on the Irish cream one but everyone prefers different things.